PHOTOS: Billionaire Just Spent $627 Million Pimping Out A Boeing-747. When I Saw The Inside? RIDICULOUS. 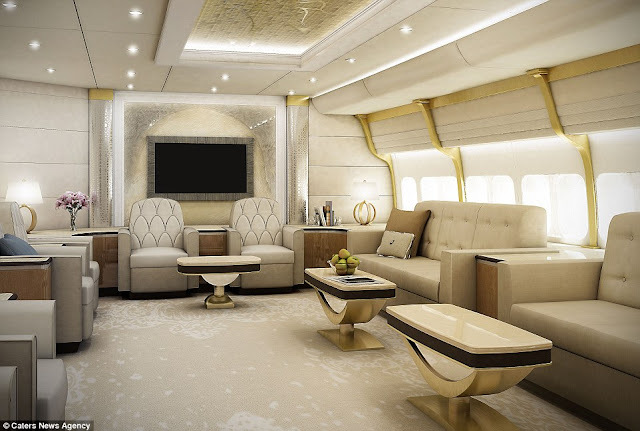 Home Featured Post PHOTOS: Billionaire Just Spent $627 Million Pimping Out A Boeing-747. When I Saw The Inside? RIDICULOUS. These extraordinary images show an enormous jumbo jet that has been converted into a luxury home for a mystery billionaire. The plane comes with bedrooms, multiple lounges and an onboard restaurant. The custom-built Boeing 747 is believed to have cost its owner $626+ million! Making it one of the most expensive purchases of all time. The jumbo jet would normally carry up to 600 passengers – but this version was built for just one insanely wealthy man, although he will be able to fit dozens of guests. Source: Billionaire Just Spent $627 Million Pimping Out A Boeing-747.